One of the best ways to have a green home is to renovate– and by reusing as much original material as possible, you can reduce the amount of virgin material necessary for construction. This beautiful renovation of a mid-century modern house by Erik Sommerfeld, from the3rdspace, and Rob Pyatt of Pyattstudio in Boulder, Colo. is a great example of resource conservation and modernization. The original concrete block and plate glass home was failing structurally due to poor soil conditions– and in need of some serious repairs. However, rather than tear the Pinon House down to the ground, it was shored up and reworked to make the house comfortable, livable, and eco-friendly. Upon arrival through the front gates, a privacy wall, which separates the rear courtyard from the front courtyard directs guests to the front entry. The front door is an offset pivot hinge door, and when open, reveals that the outside 1×1 block wall continues into the the home. The exterior of the door is composed of mild sheet steel while the interior is made from mahogany wood. The same wood lines many of the interior walls, which is juxtaposed with block walls to create interesting contrast throughout the home. The kitchen was opened up to connect to the living room. To brighten the cramped and dark 1950’s kitchen, galvalume was installed on the ceilings to help reflect light down onto the work surfaces. 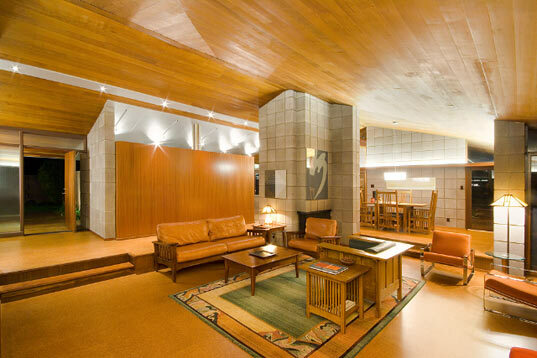 Original cork floors and cedar ceilings were refinished, and new lighting was installed to brighten the spaces. To make the home more energy efficient, doors and windows on the north side of the house were replaced to minimize heat loss in the winter. 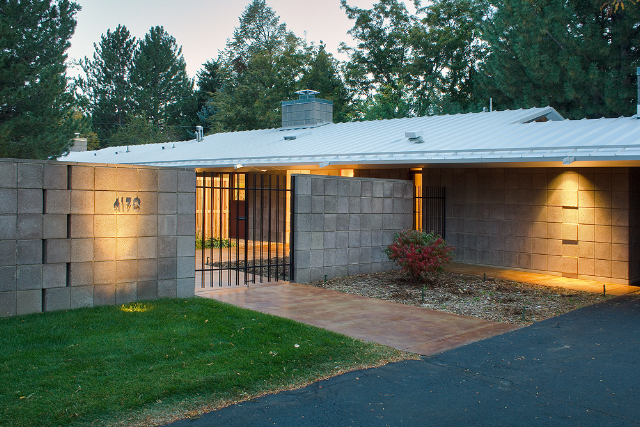 In the end, the home’s original structure, concrete blocks, cedar fence, steel door, galvalume roof, ceilings, and cork floors were all retained and refurbished. the great house.i never see before it. A great house and some stunning pictures. One of the best ways to have a green home is to renovate-- and by reusing as much original material as possible, you can reduce the amount of virgin material necessary for construction. 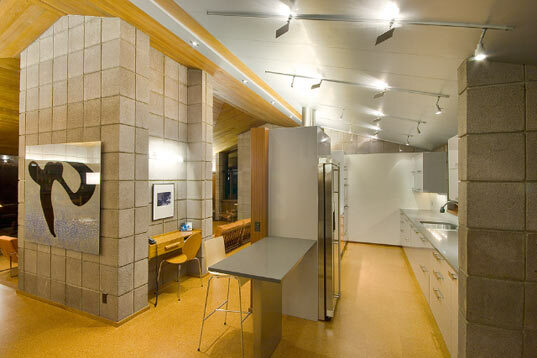 This beautiful renovation of a mid-century modern house by Erik Sommerfeld, from the3rdspace, and Rob Pyatt of Pyattstudio in Boulder, Colo. is a great example of resource conservation and modernization. The original concrete block and plate glass home was failing structurally due to poor soil conditions-- and in need of some serious repairs. However, rather than tear the Pinon House down to the ground, it was shored up and reworked to make the house comfortable, livable, and eco-friendly.